I have a confession to make: I am typing right now from the comfort of my clean living room. A living room that stays (mostly) clean. Lest you think that’s because I’m a Type A mom who makes bento box lunches on spotless counters, let me assure you I’m not even a Type A- mom. On my best days, I’d say I’m more of a B+ mom. I’m mainly just a semi-reformed slob who had to clean up my act for the sake of my marriage. My husband is a bit of a neatfreak—cluttered counters send his pulse racing. And even though that was quickly apparent after we moved in together over a decade ago, it’s taken the same amount of time for me to make neatness a habit. To be perfectly frank, I’m still working on it. When our son entered the picture, I pretty much gave up on maintaining order. Soon enough, we were drowning in stuff again. Then were fighting about the stuff again. So a few months ago, I started waging a campaign to get our home in order, and I’m proud to say it’s (mostly) working. 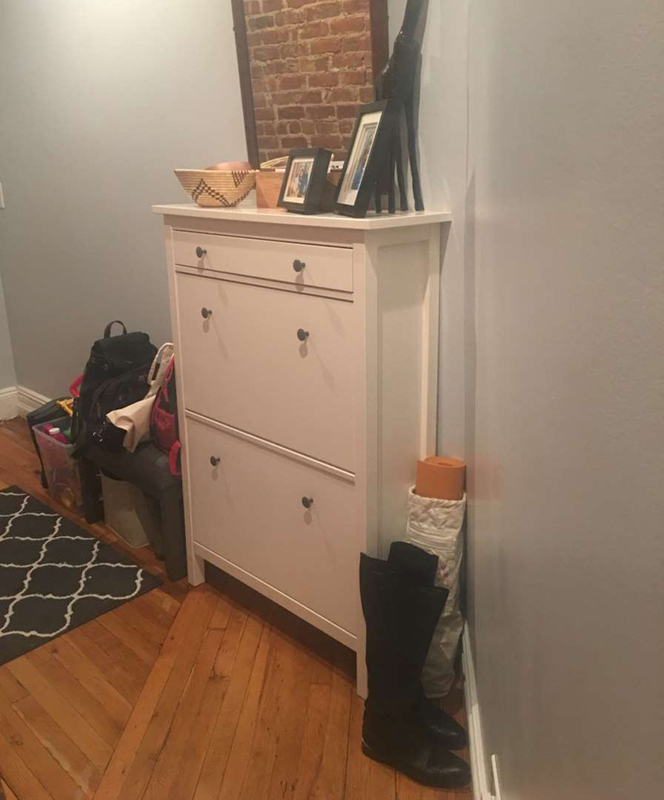 I don’t aspire to be Marie Kondo, and I don’t promise my methods will change your life, but here’s what I’ve found helps me keep my house (mostly) organized. The second we walk in the door, we place our jackets in the closet, bags on a bench, mail in the drawer, keys in a basket, shoes in a holder and gloves and hats in a bin. It took years to reach such efficiency—I am normally that person who leaves a trail of belongings in my wake after coming home. But here’s the thing: You’ll have to pick up that detritus later, so you may as well take the time to stash it by the door before you step another foot into your home. Get your kids in the same habit. My son has been putting away his jacket and shoes since he was 2 years old. 2. Treat yourself for getting organized. The best way to motivate yourself to toss out five pairs of old shoes is to have a bright and shiny new pair waiting for you when you’re done. We tried to enforce a “1 in, 1 out” rule in our house, but we couldn’t stick to it. Instead, we donate a bunch of things a few times a year, and reward ourselves for the effort. 3. Pick one small spot to organize every weekend. The concept of “spring cleaning” sounds miserable to me. “Hey, the weather is finally getting nice. Let’s hole up inside the house for an entire weekend to do something everyone hates.” Nope. Instead, I break household projects into quick, manageable chunks. Last weekend, I organized loose papers. The one before, our linen closet. This weekend, I plan to tackle the shelves above our refrigerator. With 52 weeks in a year, I feel fairly confident I’ll get to every junk drawer and bulging basket by the end of 2019. 4. Take the time to create a toy storage system—and stick to it. 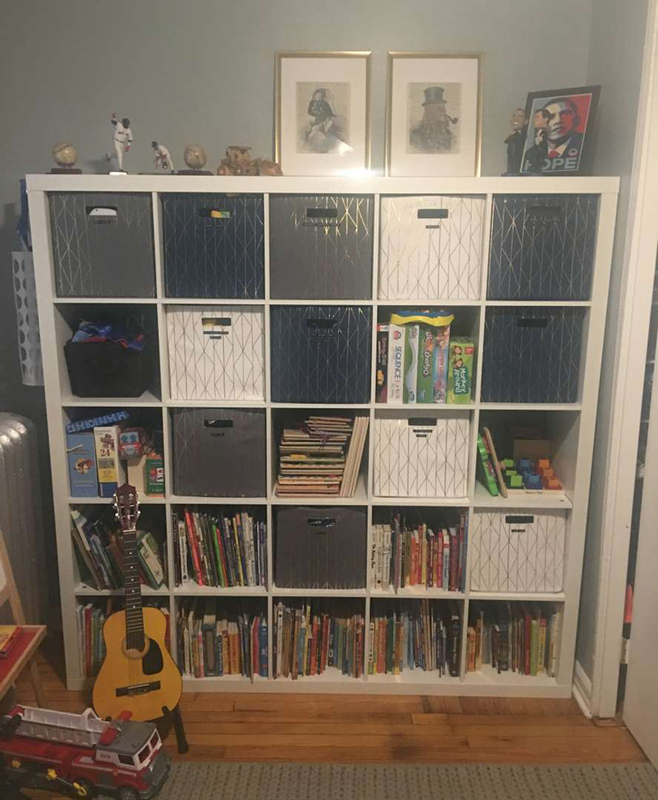 I built a bookshelf and created a designated space for all of my son’s toys, and it was one of the most satisfying projects of my life, no joke. I labeled each bin, so my husband and our babysitters can keep the system going. There are even bins inside of bins, to separate the Magna-Tiles from the Hot Wheels cars. What I'm saying is, bins are your friends. 5. Make your kids play with one toy at a time. This is the primary benefit of a toy storage system—it forces your kids to be deliberate about what they choose to play with. I purposefully store the messy toys, like Play-Doh and Legos, out of reach on the top shelf. That way, my son has to ask for it, and it enforces the idea it’s “Legos time.” Since I built the shelf, his attention span for playing with individual toys has increased exponentially—which jives with studies that show fewer toys lead to better play. But the biggest benefit is he knows he has to clean up one toy before I’ll get down another—which equals a lot less to pick up at the end of the day. 6. Wake up 20 minutes earlier. Before I cleaned up my act, I always rushed out the door in the morning with cereal bowls lying in the kitchen sink, towels littering the bathroom floor and makeup cluttering the bathroom vanity. Who has the time to tidy up? It’s especially challenging when you are trying to herd kids off to school. But I was only postponing the inevitable, and it’s so much more soothing to come home to a mostly-clean home. So now I set my alarm earlier, and make sure I clean up behind myself—and my son does the same—before we leave. 7. Enlist your partner and your kids. There’s simply no way to keep your home organized if your spouse and children don’t participate in picking up. Spending time to carefully fold your kid’s laundry into neat squares is satisfying, but it's ultimately meaningless if your spouse is just going to shove clothes in the drawer willy-nilly. I’m extremely fortunate to have a husband who cleans as much (OK, more) than I do, and one who instills the same habits in my son. But even my husband has no patience for KonMari folding—so make sure you choose methods that everyone can commit to maintaining. Then, make them maintain it. Your kids can handle age-appropriate chores, I promise, and remember, all chores are age-appropriate for grown men. One day I may be as organized as Marie Kondo, but in the meantime, I'll just strive for the satisfaction of a mostly tidy space.